"Climate-proofing is not only about finding engineering solutions – it is about building the resilience of people. " Small island developing states (SIDS), including the Cook Islands, are highly vulnerable to climate change and sea level rise due to their small land masses and vast ocean surroundings. Their socio-economic development is hindered by their isolation from foreign markets, limited natural resources, inadequate infrastructure and periodic devastation from natural disasters. Whilst tropical storms, tidal surges and cyclones have always been a feature of the climate in these South Pacific islands, data show an increased frequency of coastal inundation due to high seas and storm surges; more frequent, intense rainfall events, and an increasing frequency and intensity of cyclones. In 2005, Manga’ia, the second largest of the Cook Islands, was stripped of a vital source of trade and economic prosperity when a series of five tropical cyclones destroyed Manga’ia Harbour. The transfer of goods to the island was cut off by these natural disasters, leaving the community vulnerable and hindering the operation of the many small businesses that form the backbone of the economy in these island communities. Supported by UNDP, and funded through the GEF Special Climate Change Fund (SCCF) and the Australian Government, a project was initiated to rebuild Manga’ia harbour, using state-of-the-art decision-support tools, and to strengthen climate resilience within the community through awareness-raising and capacity building. 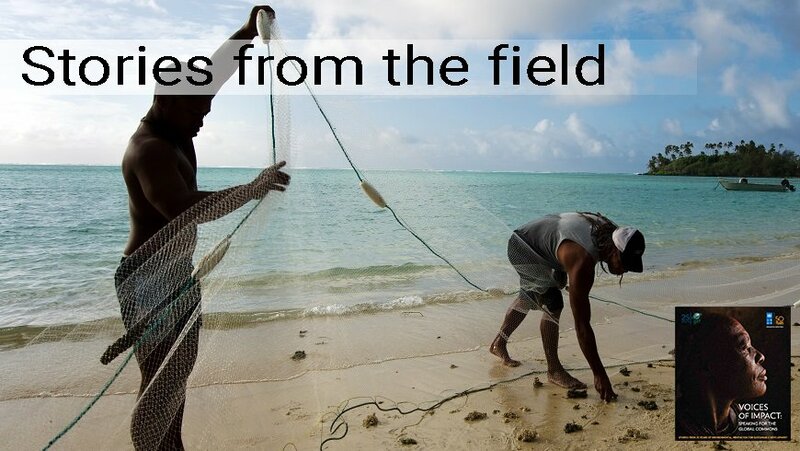 This initiative served as a catalyst for a much bigger programme of action – the Pacific Adaptation to Climate Change Project (PACC) – to climate-proof communities on other islands in the South Pacific. This is the story of Tua’ine Tuara. She is a small business owner on Manga’ia Island. She and her family bake bread – a staple in the diet of the local community. Paul Maoate is also a local. He is a Civil Engineer in the Planning and Design Division of the Infrastructure Department in the Cook Islands government. Paul is responsible for the implementation of infrastructure projects such as upgrades to water-supply infrastructure, airports, roads and harbours. A Cook Island Maori, Paul was born on the island of Rarotonga, and has lived in the Islands for most of his life, barring 8 years spent studying and working in New Zealand. He took up his current position in 2006. “When Cyclone Sally hit Rarotonga in 1987, I was 9 years old – I remember standing at the window watching the leaves and chunks of trees blowing past. The thing that really stands out in my memory, though, was the incredible unity amongst the community when cyclones came – although there was no written ‘plan’, people knew to come together and help prepare homes before the cyclone arrived, and then, afterward, everyone teamed up again to help with the clean-up and repair work. It was the same on all of the islands. In 2005, I was working in New Zealand when five cyclones hit Manga’ia, destroying the main harbour – or Avarua Landing as we call it. Through my work I met people who experienced that cyclone. They described how the harbour was completely engulfed by waves – the storm surge extended about 20 m above the harbour walls, damaging the main quay and even floating the 20,000 litre concrete water tank away. It was hearing about this that prompted me to return home, to apply my skills and help build a better harbor. Avarua Landing is the lifeline of Manga’ia. The airport runway is only 1km long, limiting the size of the aircraft that can land there. So all major supplies such as food, building materials and fuel have to come in by ship.When the boats cannot come into the Landing safely, the islanders have to go without food supplies, basic provisions and diesel (which is needed for transport and electricity generation). As an engineer working for the Cook Islands Government, I became involved in the GEF-funded project to rebuild Avarua Landing. Our objective was to rebuild the harbour so that it could withstand cyclones, high seas and storm surges with minimal damage, so that the harbour could remain operational following these extreme events. We also needed to provide a sheltered ramp that local fishermen could use safely during rough seas. The real innovation of the project was the development of a tool called the Cook Island Coastal Calculator – basically, this takes information on wave and water levels, positions of reefs and other coastal formations, and other climate-related information, and translates it into something that engineers can use to inform the design of coastal structures. It can also be used to forecast the probability of extreme events occurring, in 10, 20 or even 50 years. Before we had the Calculator, our approaches to protecting the coast were ad hoc – we would take solutions that had worked elsewhere, such as gabions or rock walls, and apply them to protecting our coastline here. We also had to rely on external expertise to assist us with scoping and providing recommendations on how to improve our coastal protection. But with the Calculator, and support from the project, we were able to re-build the harbour on Manga’ia ourselves, with the confidence of knowing it would be far more resilient to tidal surges and other extreme weather. We have been able to use the knowledge and tools from Manga’ia to upgrade another two harbours on the island of Manihiki, and build a removable jetty and coastal protection walls in Rarotonga. Right now we are constructing cyclone shelters for Palmerston, Nassau and Rakahanga. Climate-proofing is not only about finding engineering solutions – it is about building the resilience of people. When we were designing the Calculator we wanted to take traditional knowledge into account – so a workshop was held on Manga’ia with the specific purpose of gathering information from the older generation, especially those that could still remember cyclone events going back to the 1940’s and 1950’s. This story was originally published in "Voices of Impact: Speaking for the Global Commons" by UNDP.